may not feel comfortable behind the wheel. to this insecurity and help your elder loved one. family, we’re always here for you! ® Registered trademark of Living Assistance Services. 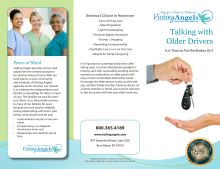 Each Visiting Angels office is independently owned and operated.